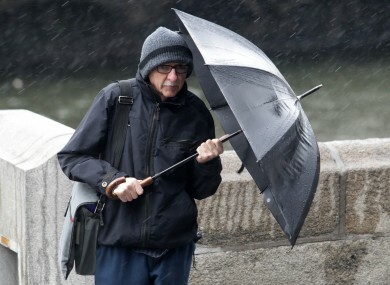 Met Éireann has issued a weather warning for overnight and tomorrow. MET ÉIREANN HAS issued a weather warning for overnight and tomorrow forecasting heavy rain in all parts of the country. The meterological service says that a warning is in place from midnight tonight until midnight tomorrow. It says that it will be a wet day countrywide tomorrow with between 40 and 60 millimetres of rain forecast in Munster and Connacht. In Leinster and Ulster between 30 and 50 millimetres of rain is expected with a further risk of downpours of between 20 and 30 millimetres across the country on Friday. The Met also says that north to northwest gales or strong gales will develop tomorrow along Irish coastal waters from Mizen Head to Valentia to Slyne Head. Motorists are being advised to slow down and allow for poor road surface conditions. Email “Umbrellas at the ready: Warning of heavy rain overnight and tomorrow ”. Feedback on “Umbrellas at the ready: Warning of heavy rain overnight and tomorrow ”.